BAGRAM AIRFIELD, Afghanistan, April 28, 2011 — Aware­ness and vig­i­lance remain the watch­words here as news spread of yesterday’s attack at Kab­ul Inter­na­tion­al Air­port that left eight air­men and a U.S. civil­ian employ­ee dead. The attack, which occurred dur­ing an uptick of ene­my activ­i­ty and coali­tion casu­al­ties coin­cid­ing with the spring thaw, res­onat­ed with a Flori­da Nation­al Guard unit that sup­ports the force-pro­tec­tion mis­sion on Bagram and with­in the sur­round­ing Par­wan province. Army Spcs. Joseph Der­amo, left, and Xavier Flo­res, right, look on as Army Pfc. 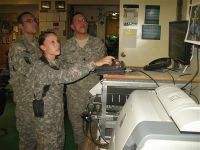 Audrey Triplett mon­i­tors input from one of three 107-foot Rapid Aero­stat Ini­tial Deploy­ment tow­ers and eight oth­er sites the 164th Air Defense Artillery oper­ates to pro­vide force pro­tec­tion at Bagram Air­field, Afghanistan, and for troops oper­at­ing out­side the wire. “When things hap­pen in an area of oper­a­tions around here, basi­cal­ly the infor­ma­tion comes down and we … look for the same pat­terns that hap­pen else­where here as well,” said Army Spc. Xavier Flo­res, a 164th Air Defense Artillery sol­dier. “If some­thing hap­pens else­where, it is an indi­ca­tion that more like­ly some­thing sim­i­lar could hap­pen here or some­where else, so you just kind of tight­en down on secu­ri­ty,” agreed Army Spc. Joseph Der­amo. Their detach­ment runs three 107-foot tow­ers on the base, all equipped with cam­eras able to scan 360 degrees in search of sus­pi­cious activ­i­ty. In addi­tion, 18 four- and five-sol­dier teams pro­vide sup­port at eight oth­er sites with­in the area of oper­a­tions. Work­ing in con­junc­tion with aerostats and oth­er ground-based sen­sors, as well as Air Force and Marine Corps secu­ri­ty forces and the Joint Defense Oper­a­tions Cen­ter, they pro­vide per­sis­tent sur­veil­lance for troops on Bagram and beyond its perime­ter. The unit pro­vides over­watch for con­voys and patrols out­side the base as well. “We save patrols all the time,” said Army Mas­ter Sgt. Wes­ley Erb, the detach­ment first sergeant, not­ing that tow­er oper­a­tors have pro­vid­ed ground troops with their sight­ings of road­side bombs being plant­ed and ambush­es being staged. One of the detachment’s proud­est achieve­ments was the dis­cov­ery of a home­made explo­sives lab­o­ra­to­ry with 600 pounds of muni­tions at a vil­lage north­east of Bagram, he added. In addi­tion, work­ing with the 34th Infantry Division’s 2nd Brigade Com­bat Team of the Iowa Nation­al Guard — respon­si­ble for force pro­tec­tion and base sup­port oper­a­tions with­in Bagram and the sur­round­ing province — the Guards­men pro­vid­ed intel­li­gence used to iden­ti­fy and cap­ture a local insur­gent leader. The unit also works with defense con­trac­tors oper­at­ing radar sys­tems that detect fast-mov­ing objects in the air­space such as rock­ets or mor­tars, and sen­sors that detect motion along the base perime­ter. “Any­body out there almost seemed like a threat to us,” he said. Now, with five months of expe­ri­ence under their belt, Flo­res said, the team knows what to look for and is ready for what’s expect­ed to be a busy sum­mer. Der­amo said the team’s mis­sion boils down to pro­vid­ing a watch­ful eye. “By keep­ing 24-hour watch on the area and the sur­round­ing pop­u­la­tion … we can allow sol­diers that have to go out and do con­voys a chance to actu­al­ly rest and not have to wor­ry about what is going to hap­pen when they sleep,” he said.